bride.ca | Wedding Photographers - Are they Worth the Price? DIY wedding photography. Anyone can do it, yes? Yes, we know.. the economy is not-so-good. But life must go on, including your wedding plans! So you need to be a little more budget-conscious. What can you cut? What can you do without? "DIY" is the new buzzword. DIY invites, DIY favours.. what else? How about photography? I mean everyone has a digital SLR camera these days.. probably a dozen people at your wedding will be carrying one of those puppies and at least a few of them are pretty good photographers too - you know, you saw their kid photos and the holiday pictures from last year and they were great! So, why not DIY photography as well? Well, we don't know.. we haven't met your friend, the talented photographer! Perhaps they can pull it off, perhaps not. "What most people don't understand is how much work goes into shooting a wedding. My husband and I shoot all our weddings together and we are used to the hours of preparation, stress on the big day and work afterward that goes into successfully shooting a wedding. Being a photographer is more than just point, shoot and burn.".. Congratulations! You are engaged. You've got a ring on your finger and you are starting to plan your perfect wedding day. You've set a date, booked the hall, tried on dresses and now you are researching photographers. Yikes, you quickly discover how expensive some of them can be. I know, I went through this whole process when I was planning my wedding. I had a small wedding party and an even smaller budget. I tried to involve my friends in ways that helped to save us a few dollars: one of my best friends played me down the aisle, a musician friend played our first dance and my sister helped with the cake. My friends are very, very talented. I decided to ask a friend to do the photos as well. She is creative and studied art in University. She would be perfect, right? But, it didn't end up working out and I was forced to hire a professional photographer. This was the best decision I made - next to saying "yes!" to my husband. Our photographers were fun, experienced and were very professional. After spending an afternoon with them, I felt as if they were our friends. This experience helped to rekindle my love for photography. Since then, I have become a wedding photographer myself! It was such a positive experience and this is the feeling that I, at Green Apple Photography, want all my brides to have. What most people don't understand is how much work goes into shooting a wedding. My husband and I shoot all our weddings together and we are used to the hours of preparation, stress on the big day and work afterward that goes into successfully shooting a wedding. Being a photographer is more than just point, shoot and burn. Although you may have someone in your life that takes great pictures with his or her SLR camera, that doesn't mean that you necessarily want them to photograph your wedding; especially if they have never shot a wedding before. Do you really want them to use your special day as a photographic trial run? Most people think that shooting a wedding is easy. I can tell you from years of experience, it's not! The bride getting ready: she needs to be comfortable with me so that I can get great shots. I make sure that we have a relationship before I get in the dressing room. The bride with her family: before the ceremony, everyone can be stressed and nervous. I need to get everyone in a relaxed mood and make them forget they were ever nervous in the first place. The Ceremony: there is so much going on during the ceremony, that you have to know where and when everything is going to happen. Where you want to be and the best light in the room. Sometimes you need to be in two places at once. Thank goodness for my husband (a talented photographer in his own right) who always shoots with me. We think that two heads are definitely better than one. "Formal" pictures with both the bride and groom and their families: it can be a huge task to organize, pose and keep everything moving along. Photos of the bride and groom: these are, in my opinion, the most important pictures of the day. They need to be natural, romantic, dramatic and perfect. It takes a special skill to create those moments and capture them in the best possible way. 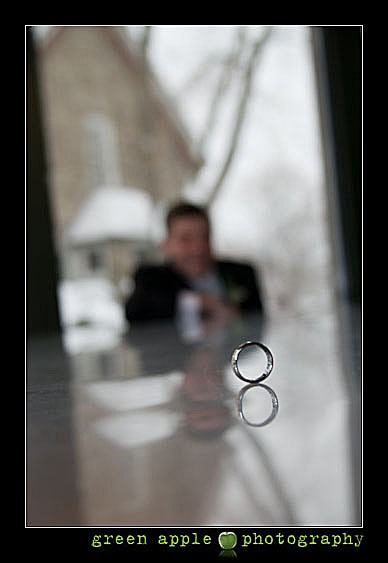 "The post-wedding work can take almost twice the time that the actual wedding takes to shoot.".. Now, once the pictures are taken, most people think that our work is done. The wedding is over, now just burn a CD right? Not so fast. 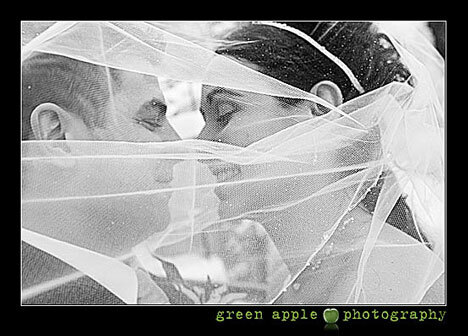 Most wedding photographers, Green Apple included, don't shoot their images in JPEG format. We use a RAW format so that when we are editing, there is more flexibility. We can adjust exposure, contrast, and brightness and colour much more effectively, without losing any data from the original file. Here is what we need to do to each of the over 800 files we would take at the average wedding. and print photos for thank you cards. 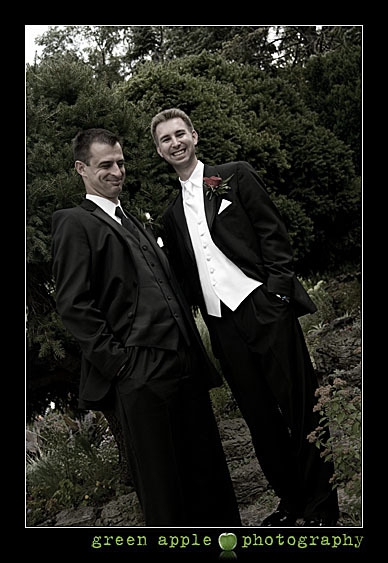 We produce a professional, high quality product that every bride and groom can't wait to show their friends and family. They go home in two weeks with a DVD of all the edited images in both colour and black-and-white, an online gallery to show their friends and family, an 11x8.5 thumbnail album to share and enough photo cards to include in their thank you notes. They are able to print the photos from the disk they received, or order prints directly from their online gallery. And that is on top of their complimentary engagement photo shoot. Please don't be one of the brides to contact me needing a professional to fix her wedding photos that "Uncle John" took. Think about how much this day means to you. Do you really want to risk not having the best possible photographs? After all, these will be the pictures that you look at when you want to remember your wonderful day.